So to the big one: my 50th game! No game is going to stand up to that level of pressure so rather than pick something recommended to me as great, I picked the one game in the entire country that had the most interesting theme to me: Madchester. It’s the one musical movement I feel any sort of identification with, even if I only really got into it later in the 90s, moving backwards out of Britpop rather than the other way around. So criticism number one relates directly to that: how the hell can you have a Madchester room and not soundtrack it with Madchester music? I mean I know by now not to read too much into escape room themes and wasn’t exactly expecting them to offer us Es on the way in but I did figure they’ve have The Smiths playing at some point. Not that it had any impact on the quality of the game, and the ambient background music was pleasant enough, but it was just a really bizarre choice. I’m aware there are probably PRS/licensing issues to be overcome, so it’s not that simple, but if you’re making a Madchester room then surely you overcome those? 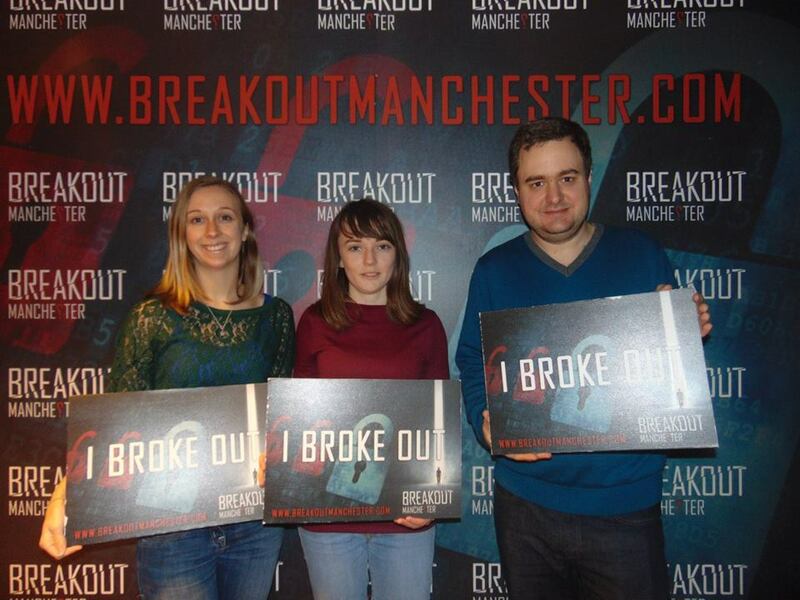 Anyway, off we head to one of Breakout Manchester’s two locations, smack in the middle of the city where five of their games are hosted (including what looked like another version of John Monroe’s Office – is that game the world’s most replicated design?) and took a seat as we waited to be taken into the room and our briefing. What followed was the single longest and most convoluted briefing I’ve ever seen in a game. Essentially the game is non-linear, you’re thieves trying to nick Madchester memorabilia from a teenager’s bedroom, and you’re looking for certain objects or things that can stand in for those objects, which you need to file away, and then when you have them all you can then use those to figure out a code which gets you out of the room. I get the feeling that at one point a lot of this was left unexplained, especially how to derive the final code, but without it too many people were left utterly baffled as to what to do. Which makes sense though it would have been better to have found an in-game way to communicate all this, rather than have the host talk you through the structure of the entire game before you start (and such an info-dump, without notes, would probably make a lot of people more confused and overwhelmed). Another weird choice. Still, the game itself is solid. There’s a purity to its non-linearity that you don’t see often – usually there’s some structure, some gating of puzzles behind clues found by solving others, but here pretty much everything (except for bits found in the second, locked, room) was available from the start. On the plus side that meant there was always something to be working on, something to move on to if you were stuck, and we were making constant progress… until we were around 85% of the way there, which is where the non-linear approach falls down a bit. The remaining puzzles were stumping us, and so we needed a hint, with which we solved one of them, and were back to where we started, needing another hint, and so on. 90% of the hints we took were in the final ten minutes! There’s no easy way to avoid this but it did feel a little bit weird. Going back to the theme, it’s well represented in the spacious room, but it’s worth noting that the theme is not, as it might appear, Madchester. 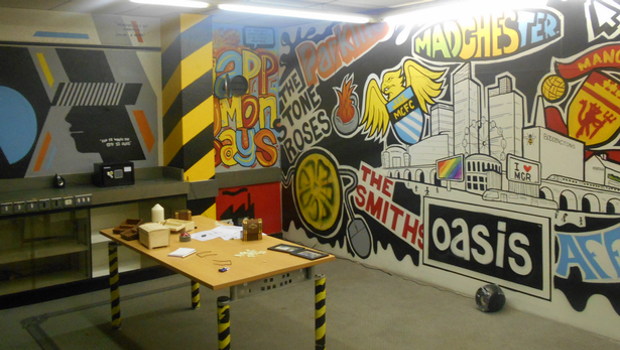 The theme is Manchester, perhaps 90s Manchester at a push, but it’s not just focused on the specific music scene – there’s memorabilia for sports stars, significant places and all sorts. Playing with teammates who were only born in the 90s did lead to an amusing interaction, as one of them found an odd symbol, perhaps some sort of secret code or clue? Yet depressingly I recognised it as the Take That logo. It’s a decent room overall, with a nice setting and some good puzzles. 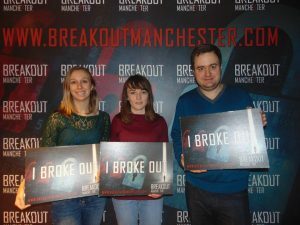 I’d say the puzzles are on the harder side – it has the highest difficulty rating of all Breakout Manchester’s rooms and that’s well earned. Though I’m tempted to dock it points for not having a single reference to James, the greatest Manchester band of all time, but I can rise above that. Sometimes. 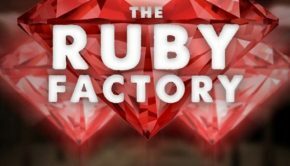 Summary: A solid game that will especially appeal to those who like hard puzzles and rooms which take a non-linear approach. Or people who just want to revel in some Manchester paraphernalia. Dean Love Dean is a professional writer who has worked for The Mail On Sunday, The Digital Fix, MicroMart and others. 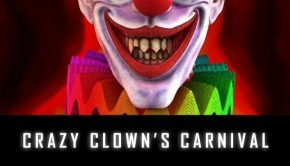 Escape Review has been escaping rooms in the UK since 2014.